How many times have you read another recipe promising the “Best Mac Cheese Ever!”, rushed to make it and ended up with another disappointment? I have, countless times. I’ve tried them all, nutritional yeast, carrots, sweet potato, pumpkin, cauliflower. All of them either wrong or awful. Most of them I tried giving as leftovers to my dog Jess, but she sensibly rejected them. 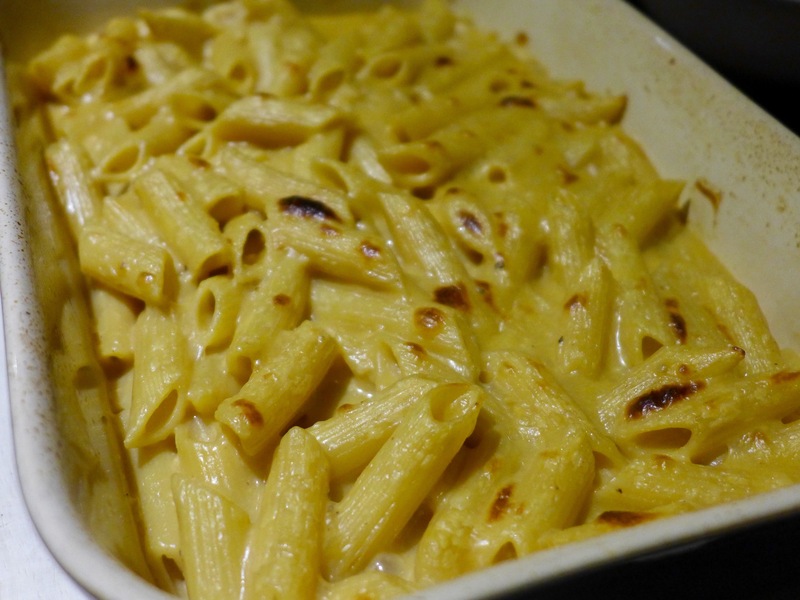 I used to make dairy macaroni cheese using a variation of a recipe by Heston Blumenthal, that used no milk just a mixture of cheese in a wine reduction and stock. It was great then, not at all gluggy, sharp and adult in flavour. I think of it as macaroni and cheese for grown ups. 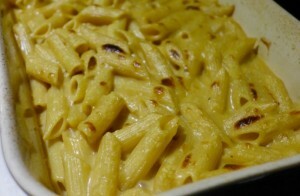 So I gave it another go recently using a mixture of vegusto piquant, daiya cheddar and tofutti cream cheese. I’ve tinkered with it, veganising it obviously, but also simplifying it a bit and using less wine as the original is pretty sharp. I think it is a winner. Jess isn’t getting any leftovers from this one, even though she’d probably love it. It also works wonderfully as a cheese sauce for cauliflower and broccoli. Cook the pasta in salted water until done. Drain. Mix in the truffle oil. In a saucepan, reduce the white wine over a high heat to 30 ml. Add the hot stock to the reduced wine. Mix the grated cheeses with the cornflour and add to the saucepan. Stir until the cheese has been melted and incorporated into the sauce, then stir through the pasta. Cook over a medium heat until the pasta is warmed through. Place into an ovenproof dish and bake in the oven until nice brown spots start to appear.